For a variety of personal and professional reasons, we need to take a break from Not Invented Here. We will finish up the current storyline (more or less by the end of the year) and then go on hiatus. We'll be back as soon as we can -- make sure you don't miss out by signing up for our email delivery. We have good news, too. The complete run of NIH is now being syndicated on GoComics four days a week, alongside such classics as Peanuts, Calvin & Hobbes, Pearls Before Swine, and Get Fuzzy! We hope this will bring a whole new audience for the strip. We especially want to thank our patrons for making this last year possible by paying us for our time. Thank you for reading NIH, and we'll do our best to return as quickly as possible. 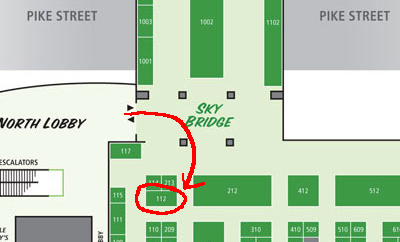 I'll be at Seattle's own Emerald City Comic Con this weekend, hanging out at the Unshelved booth, number 211, just next to the sky bridge, across from both Oni Press and Cyanide & Happiness. I've got paperback and hardcover copies of the first two NIH collections, and I'd be happy to do sketches of our characters if you ask nice. Come tell me your work stories! NIH will be five years old next month. That's a lot of backstory to catch up on if you're new to the strip. So we created a helpful OUR STORY SO FAR save point. If you'd like to get a friend started on the strip, just point them there and they'll be off and running! Can you feel the excitement in the air? That's because Emerald City Comic Con, Seattle's hometown comics and pop culture extravaganza, is just a few days away! If you don't already have tickets it's too late! They're sold out! We'll have both Not Invented Here books, plus IT barrier tape and magnets while supplies last. And Jeff will be drawing drawing drawing - come by and get a doodle for free, or commission something more sophisticated. Pro tip: Jeff can draw ANYTHING but he is especially good at spaceships. I've gotten a number of questions about how (and why) I made our new ebooks the way I did, so here's a FAQ. Why are they EPUB instead of PDF? We wanted to sell them on the iBookstore (now available! ), which requires EPUB. Readium is a great open-source cross-platform e-reader, so EPUB (specifically EPUB3) became the lowest common denominator. 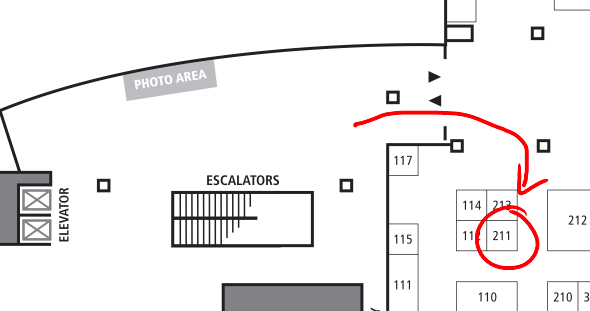 However I do anticipate making a PDF version in the future so that we can sell them on ComiXology. Prior versions of EPUB are perfect for flowing text + illustrations, like a standard web page. In fact, EPUB is really just HTML + metadata, and readers like iBooks are just specialized web browsers. But the horizontal form factor of our books meant they needed the reader to be in Landscape mode, which meant using the fixed-format features of EPUB3. I ended up needing to produce a different HTML document for every page in the book. e-ink Kindles would not be a good match for our big colorful strips, but I hear that the Kindle Fire format isn't too too different from EPUB3, so that's on my list too. Did you use iBooks Author? No. For one thing, iBooks Author's TOS would forbid us from selling them anywhere else, and we wanted to sell them on Gumroad. But also I didn't want to drag and drop four years worth of strips. So I cobbled together an automated approach using Ruby and Slim templates. I did spend many hours working on the code, but it amortized a little bit every time I made a new version of the book. Now when I type "rake" it compiles and validates three versions (Gumroad, iBooks, iBooks Sample) of each book. And adding a new book has proven to be very quick indeed. Gumroad books link to buy other books on Gumroad, iBooks books link to iBooks, and iBooks Sample only include selected "greatests hits" strips. Why did you use Gumroad? It was highly recommended by fellow cartoonists, and made it easy to offer the books for sale at minimum cost while also allowing us to distribute the books to our Kickstarter backers for free with coupon codes. Can I have your automation code? Eventually. I am helping a few friends put their books into EPUB3, which has required some healthy code changes (every time I add a new book a little more code gets replaced by metadata). After a few more I plan to put my little rakefile on GitHub. Use source control. This is good advice for almost all projects. It gave me the freedom to mess around and then revert to a known good version when things went south. Follow the directions. I spent many hours trying to figure out why my fixed-format books weren't showing in fixed-format. Turns out the META rendition tags don't like whitespace. Don't slavishly duplicate the print book. Ebooks don't need page numbers or big margins, which meant more room for our art. I was also able to add extra content that got cut from the print books, and I moved a bunch of the boring legal stuff to the end. The more time I spent on the ebooks the more opportunities presented themselves - I turned the character design histories from Runtime Error into animations, and future updates will have some other fun features. Don't Repeat Yourself. EPUB3 has a fair amount of repetition, and each one is an opportunity to introduce errors. This is another place that automation really paid off. Retina resolution FTW. My artists make beautiful pictures, and they (literally) shine on the latest devices. I am very proud of our ebooks. They present a vastly improved reading experience over the website, and go back to how I prefer to read comic strips: collected in books. I hope more of my cartooning peers will take the digital route so that I can read their work on my iPad!